The music of the Caribbean is as varied as the cultures and personalities of the hundreds of islands contained in its waters. From Jamaican reggae, to Cuban rumba and mambo, Trinidadian calypso, Guyanese tassa and Puerto Rican plena and salsa, the individual sounds reflect the native and colonial cultures that shaped each island’s culture. The strongest inspirations for most Caribbean music are African and Latin music, but French, American and native beats and rhythms can also be heard. Caribbean music has inspired musical artists around the world, and their instruments are used everywhere. The most important instrument in Caribbean music is the drum. Besides being the foundation of African music, which slaves brought with them to the area, drums are inexpensive, simple and can be homemade. Nearly all Caribbean music possesses a strong beat created by drums. Most drums are some version of the bongo or the larger congo, which is a smooth wooden drum that is played with the hands. Tassa drums are conical hand drums made of clay and goatskin. Timbales are a pair of small metal-framed drums on a stand that are played with two sticks and are usually set up with a wood block and one or two cowbells. 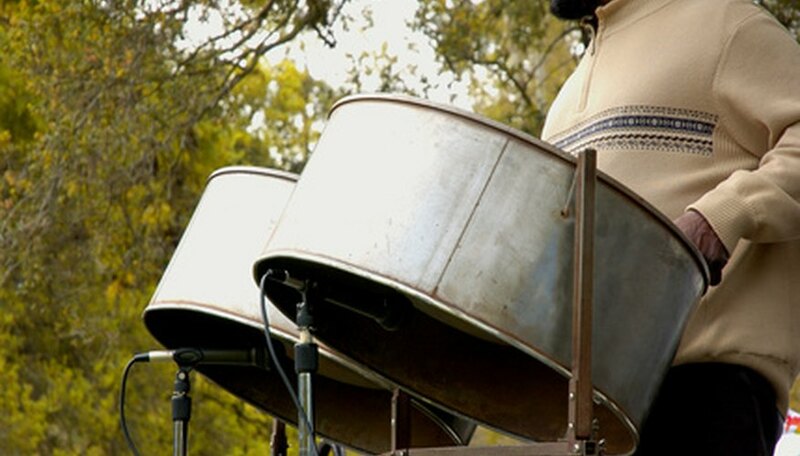 While they are called drums, steel drums, or pans, are more of a general percussion instrument than what most people consider a drum and have a unique sound. These instruments are made by taking a metal oil or chemical drum, cutting off an end and pounding out the remaining end into a concave surface. The maker then flattens and works areas of the concave surface to create notes. There are several different types of pans, each producing its own set of notes. Some are made from a single drum, like the tenor pan, while others use multiple containers, like the bass pan. Claves are two sticks of wood that are hit together, and cajones are wooden boxes that are struck with a player’s hands while he sits on them. These are staples in Cuban music. The Puerto Ricans use a güiro, a small, dried hollow gourd with grooves cut into the side. They make sound by scraping a stick against the grooves. Maracas, small hollow dried out gourds with handles, filled with dried beans or pebbles, are another popular Caribbean instrument. Cuatro, once a guitar with four strings, now with five pairs of strings, is the national instrument of Puerto Rico and play an important part in most Puerto Rican music. The majority of islands with Latin inspired music incorporate some form of guitar into their sound. Other versions of the guitar that can be found in the islands are the bordonua, the requinto and the triple. Jamaican reggae uses electric guitars, led by the presence of a strong bass guitar that drives the beat.